The engine and transmission housings are rigidly interconnected and assembled to form a half-frame of the tractor frame of T-40. 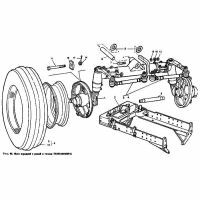 Half-frame, rigidly fixed to the housing of the clutch and gently (by means of rubber gaskets) connected to the front part of the crankcase unit enables offload engine from large and strong impacts as well as the shaky arising during operation and the tractor. The angled front spars poluramy fastened cast steel beam to which is fixed below the front axle, and the top steering servo (also known as GUR) and nodes connected thereto, such as the tank of the hydraulic system (HS) and the engine air cleaner.